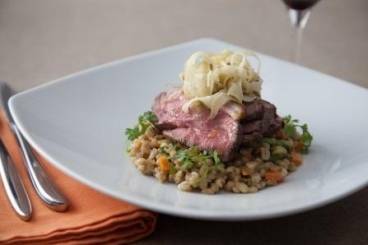 Warm and filling pearl barley risotto with tender rump of lamb, fresh wild garlic and sweet and sour marinated fennel. Season the lamb with Maldon sea salt and add to a hot pan. Start skin side down to release some fat and then colour on all sides. Add the butter and rosemary to the pan and baste before transferring to the oven. Cook for around 10-12 minutes. Rest before serving. Peel and dice the shallots, carrots and garlic. Wash the pearl barley well. Sweat the shallots, garlic and carrots with thyme in oil, then add the pearl barley and fry lightly, add the stock a ladleful at a time and simmer, stirring occasionally until the barley is tender. Finley slice the wild garlic and add at the end with a knob of butter. Cut the fennel in half and remove the tough core. Finley slice the fennel on a mandolin and marinate with the sugar, vinegar, fennel seeds and olive oil. Season to taste. In a bowl, ladle in the risotto. Slice the lamb rump and lay on top. Place the marinated fennel on top and garnish with wild garlic leaves.